Yennai Arindhaal has not just overtaken all the other albums in this week top 10 chart but has also earned itself a hit status. Yennai Arindhaal aka Ennai Arindhaal is a Tamil movie with production by Shri Sai Raam Creation, direction by Gautham Menon, cinematography by Dan Macarthur, editing by Anthony. 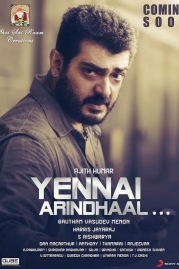 The cast of Yennai Arindhaal aka Ennai Arindhaal includes Ajith Kumar, Anushka, Arun Vijay, Trisha.